Ceskoslovensk Aerolinie (Czechoslovak Airlines) was founded in 1923 and is based in Praha (Prague). No doubt they changed more often with liveries, but history in my collection does not date back to the 1920s ! 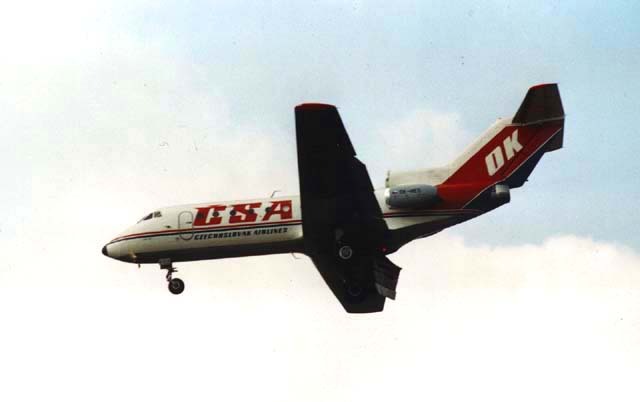 Yak-40K OK-HEQ (cn9741056) is seen here on finals to runway 19R at Amsterdam Int'l Airport Schiphol in april 1992. The fleet of CSA in 1992 consisted of some 6 Yak 40, 7 Tupolev Tu-134A, 7 Tu-154M, 3 Ilyushin IL-62, 6 Il-62M, but western equipment had made an introduction with 2 Airbus A310. The ICAO callsign was CSA Lines (source: JP91/92 Airline Fleets). One would have thought that OK Jet would have made a more fitting callsign ! After seperation of the Czech Republic and Slovakia, changes effected the airline. 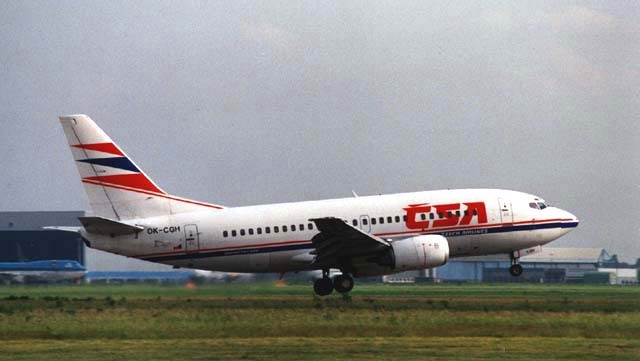 It is now called CSA Czech Airlines and the callsign has been shortened to CSA. The flightnumber prefix has remained the same: OK / CSA. The livery changed considerably. The fleet now consists mainly of western equipment: 8 ATR 72, 15 Boeing 737, 2 Airbus A310 and only 4 Tupolev Tu-154M remain (source: Airline Fleets JP1999/2000). 737-55S OK-CGH (cn28469/2849) is seen here landing on runway 27 at Schiphol.